In Indianapolis, more than 1,100 pounds of nonperishable items were collected during the two-week drive, which ran from November 1 to 15. 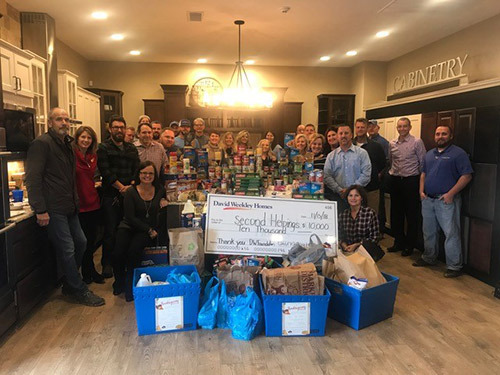 “The food drive is for such a great cause and I appreciate the long relationship David Weekley has shared with Second Helpings,” said Brad Willem, purchasing manager with David Weekley Homes. Locally, the Giving Thanks, Giving Back Thanksgiving Drive benefitted Second Helpings, a nonprofit organization that provides nutritious meals for thousands of hungry children and adults in greater Indianapolis. David Weekley team members provided the collected items to Second Helpings to distribute to families in time for the holiday. In addition, The David Weekley Family Foundation donated $10,000 to the nonprofit to purchase a backup generator. Second Helpings is an organization that provides nutritious meals for thousands of hungry children and adults in greater Indianapolis. The organization accepts donated perishable and overstocked food from wholesalers, retailers and restaurants, and then creates 4,000 hot nutritious meals daily that are distributed to more than 85 social service agencies. Team members from David Weekley Homes donated 1,100 pounds of nonperishable food items to Second Helpings to benefit families in need.